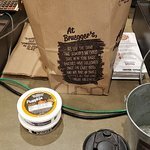 Bruegger's a good source for fresh bagel sandwiches in Avon, CT.
We always enjoy Bruegger's breakfast bagel sandwiches. Chicken salad bagel needed more chicken salad but I didn't complain. Coffee always hot. Staff always friendly. Good place to stop in for a quick breakfast. Lots of room and the service is fast and friendly. A bagel and coffee make for a good way to start the day. Chain with a nice selection of different bagels. Prices about average. Bagels were tasty although we did not try the special toppings. On the way out of town we grabbed a quick bagel at Brueggers. I now have to find out where there are more Brueggers. Fresh and warm. Nothing to really praise but nothing wrong either. Go there for bagels and coffee usually. Have had lunch and was so so. I absolutely love Bruegger's bagels. They are perfectly cooked and the cream cheese is also wonderful. I think they definitely make them smaller than they used to however they are still delicious. Their sandwiches and coffees are also great. Perfect quick breakfast/lunch stop! 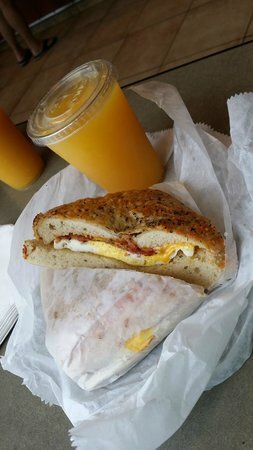 Just met a friend there - thoroughly enjoyed the everything bagel (save money and skip the cream cheese - just have butter). I wouldn't buy a coffee there again. We had a booth and that was great for an informal visit. Get quick answers from Bruegger's Bagels staff and past visitors.